Hail and well met! We are the Figures in the Fog and today we’ll be reviewing the new cards for Ashes: Rise of the Phoenixborn, added in The Demons of Darmas. This is the first entry in the series. So without further adieu, let’s take a look at our first card, the Phoenixborn of Darmas, Harold Westraven. Harold is a unique Phoenixbron with an interesting stat line. 5 Battlefield is average, 21 Life ties with Lulu for the second highest life total in the game, and a measly 2 Spellboard is the lowest in of all Phoenixborn. While on the surface, this stat line looks quite restrictive, looks can be deceiving, especially when Harold is involved. His Phoenixborn ability, Mark Prey, is an incredibly powerful board control effect, that makes Aradel jealous. For the low cost of a side action and a single basic die, he can attach a Hunter’s Mark Conjured Alteration to a target Unit. Unlike other powerful Alterations, this Alteration is tied to an ability that targets a Unit, meaning it can be Decoyed by Leo’s Glowfinch or prevented altogether using Golden Veil. Hunter’s Mark has a Conjuration limit of 1, but it’s good enough to only need 1. 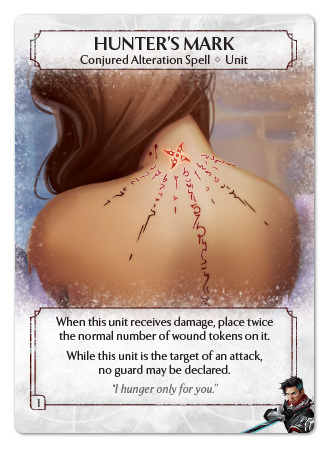 Once attached, whenever that Unit receives damage, it gets two wounds per 1 damage. And to make matters worse, whenever that Unit is declared the subject of an attack, no guard can be declared. Hunter’s Mark is an incredible asset for Harold. The ability to place double the amount of wounds for each damage dealt to it, will make quick work of enemy Turtle Guards and Elephant Riders. This effect pairs well with anything that deals damage like Anchornaut, Crescendo, Fire Archer, Natural dice power, and Stormwind Sniper, but not effects that deal wounds like Hammer Knight, Molten Gold, River Skald, and Sonic Swordsman. However, that also means that his opponent’s will be able to get added value from Particle Shield and Protect. The second half of the Hunter’s Mark is also quite good, and will allow Harold to turn any Unit into unChokeable Winged Lioness. X: Harold seems good, a little too good I think. Typically Phoenixborn with high Life totals, pay for it somewhere. Maeoni only has 3 Battlefield. Lulu only has 4 Battlefield. Saria’s ability doesn’t impact the board. Harold only has 2 Spellboard. But I don’t think that’s nearly as impactful as 3 or 4 Battlefield especially when it is paired with an ability as powerful as Mark Prey. Harold could reasonably have 17 Life and would still be competitive. Harold’s signature card is a Reaction spell called Harvest Soul. Harvest Soul can be played for free, whenever a Unit is destroyed as a result of an effect that Harold controls. The destroyed Unit is removed from the game, Harold gets to draw one card, and a Dark Transformation Conjured Alteration is attached to Harold! N: We all know the best cards are the free ones; Fear, Illusionary Cycle, Double Edge. Harvest Soul is less than free. It is just a gain on all fronts. That’s powerful. This is slightly counterbalanced by his slow start with 2 Spellboard, but with that amount of life and good FF choices, he’s not going to be worried. Harold will definitely be a meta changer and capable of throwing down against the top tier Phoenixborn. When Dark Transformation is attached to Harold, Harold selects 1 die in his exhausted pool, rerolls it, and places it in his active pool. Harold also gets +1 Battlefield, +1 Life, and +1 Spellboard, for each Dark Transformation that is attached to him. 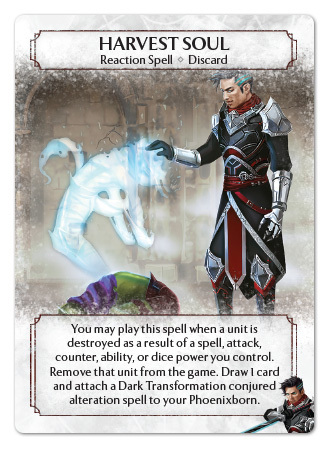 Dark Transformation also has Spell Guard, so once attached, not even Dispel can remove it. Wow! Harvest Soul and Dark Transformation are crazy good, and all for the net cost of drawing 1 card and gaining 1 die. However, there are several other interactions to consider with these cards. Recall that Harvest Soul is a Reaction, meaning that an opponent can deny it by using Law of Sight and Harold can recur it by using Secret Door. Also, despite being triggered by a Unit’s destruction, Harvest Soul doesn’t target. This means not only can Harold remove troublesome Conjurations and Allies from the game like Anchornaut, Elephant Rider, Glow Finch, Fire Archer, and Luminous Seedling, but it also works on Holy Knight and Seaside Raven. X: This takes Harold from being a little too good to being outright busted. Even though he’s likely to cap at 7 Battlefield, 23 Life, and 4 Spellboard, most games, the possibility of being even higher is insane. And if that wasn’t bad enough, the fact that he receives these bonuses for destroying Units, a thing he wants to do anyway. A thing that is trivialized by his Phoenixborn ability. And just to add insult to injury, he removes the Unit from the game, with virtually no counterplay. Harold has too many strengths for the minor inconvenience of only starting with 2 Spellboard and a First four. Harold is a very unique and versatile Phoenixborn. His base stat line is already impressive, but his potential to grow up to 8 Battlefield (tied with Aradel for 3rd highest), 24 Life (highest in the game), and 5 Spellboard (tied for highest) is incredible. Those stats, paired with a Phoenixborn ability and a signature card that aren’t tied to any specific magic types, and you have a Phoenixborn that can fit into almost any deck archetype. His high Life total will help give him time for a control or burn style deck, though his starting 2 Spellboard may make that difficult. 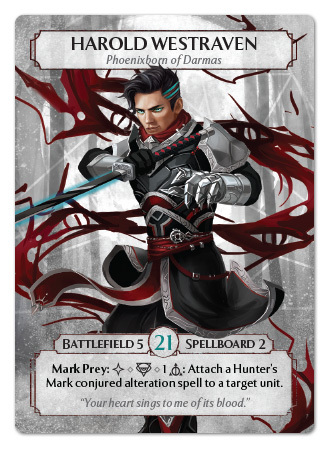 His Mark Prey ability allows him to easily manipulate the Battlefield, increasing his control options and allowing him to fit nicely into a swing deck. Harvest Soul’s ability to remove key Units from the game provides him with a unique edge in some match ups, especially in long games, lending itself to either a tempo or a control deck. And that’s without seeing any of the other cards his base deck is bringing with him. The biggest drawback on Harold is the lack of flexibility in his First Five and potentially problematic deck constraints. Due to Harold’s dependency on Harvest Soul to increase his Spellboard and to a lesser extent his Battlefield, Law of Sight will likely be used as tech to slow down his opening. This means that Harold players are going to have to choose to accept only having 2 Spellboard during the beginning turn(s) of the game and choose their first five cards. Or they will have to accept that they are only starting the game with four cards in their first hand, since Harvest Soul won’t be able to be played. This will make him even more vulnerable to cards that can disrupt his First Five, like Imperial Ninja or Three-Eyed Owl. The thing to keep in mind is that he can’t reliably play Harvest Soul early, he is stuck at 2 Spellboard. This means he’ll have to choose between powerful utility effects like Abundance, Magic Purity, and Shifting Mist, and a consistent source of Units, with Conjuration Ready Spells. Harold may need to rely upon Allies rather than Conjurations to keep presence on the Battlefield. N: I like that there is at least a bit of counter play against Harold. Choke at least breaks even on dice (unlike certain other Phoenixborn I could mention) and can even be Golden Veiled if need be. I think Law of Sight is a decent tech against him, and like it in Orrick who likely can afford to play the extra cards. It very much has the same issue as Law of Assurance against Vicky, however, wherein you are only stalling the inevitable. In the end, I’m honestly a bit conflicted on Harold. On the one hand, I’m pretty certain he will influence a change back to an aggressive meta, which is my style. 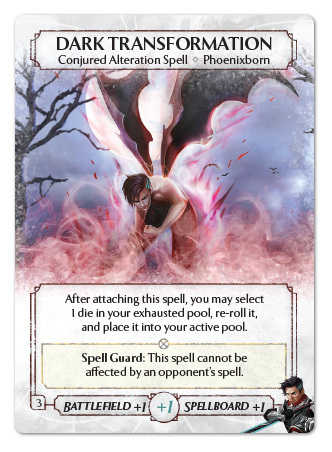 On the other, I wish this had been done through cards available to all Phoenixborn. As is, I only see another contender for broken top tier Phoenixborn. Whew! That was a lot to cover, and there’s still more! But that will have to wait for another day, and another article. In the meantime, tell us what you think. Are there any powerful interactions we overlooked? Are you excited about Harold? What types of decks do you want to run him in? Tell us about it in the comments below. We have a lot of exciting things planned for you, so keep watching. We’ve got to Fade Away now but the Figures in the Fog will return! I Agree that Harold will be very relevant to the meta game, but i don’t think he is borderline overpowered. I really like that he can effectively kill an Elephant rider with some 2/1 and an anchornaut. First of all Harvest Soul is very low tempo as it does not impact the board state. One might go as far as to say that the impact for the current round is so low, that it might as well be nothing. Will it be impactfull that you gain a battlefield slot >in that round< ? A Spell Board slot ? A PB life point ? Probably won't change anything in the current round let alone the turn. The card you draw only replaces Harvest souls, so Harvest souls sometimes will have the same effect as a card that reads "When a unit dies, Draw a Card, reroll a dice". In that case only the "reroll a dice" will be meaningful and there is obviously some delay compared to the card draw at turn start. In this perspective Harvest soul is a terrible First Five Card. Best Case : First Four + 1 Random draw+1 die, while your opponent enjoys Five cards of his choice. Then the most important fact about Harvest Soul however is : It is not another Card. duh. It is not Fear, it is not Gravity Chaos, it is not Rins Fury – Harolds loyal card is Harvest Souls, a reactive card with little immediate impact and not a proactive one. Harolds power has a trade off : Deck building constraints. If you draw a fourth ready spell by turn two you will most likely not be able to put it down and that is not that unlikely. ~61 % Chance to not draw Harvest soul in your second hand after you already used one. Ignoring minor rounding errors that gives a 25% or 53% Chance to draw one or more dead ready spells on turn 2 depending on Deck Construction, with the lion share in percentages coming from the "or more" part of "one or more". So if you want to use 5 Ready Spells you will have to build a deck that can live with drawing a few dead cards on turn 2. For Comparison: If you played Jessa instead you get 3 strong cards (fear) in the early turns. If you play Harold you don't get that but will often have to dance around playing ready spells, maybe allies too. And you get 3 bonus dice at random points in the game. For Huntersmark : Harold will have a really bad time if he does not kill the unit with Huntersmark on the same turn, because some of the new cards can remove conjurations from the game. Huntersmark obviously is a conjuration. With there only being one copy that would mean that Harold could lose his ability for the rest of the game. If he becomes too good, people will consider this. With Particle Shield and Protect that might be a serious problem as that would lead to Huntersmark staying on the field and potentially being removed from the game. You have some interesting points, but I think the results of GenCon show that Harold is indeed extremely good. It remains to be seen if counters to him will develop. On thing to note, however is that Hunter’s Mark actually isn’t considered a conjuration. A conjuration is specifically a unit, instead it’s a Conjured Alteration. It can still be removed from the game by the ability of the Glow Finch, however.